Demons are perhaps the most enduring monsters of all. From the earliest times people have tended to blame demons whenever something has gone wrong, be it a disastrous harvest or a devastating plague. Ancient Egypt had mischievous demons such as Bes, while Mesopotamia boasted such charming creatures as Pazuzu (who millennia later would become the star of the horror film The Exorcist). While Pazuzu had a clear and terrifying physical form - head of a lion, feet of an eagle, tail of a scorpion - the djinn of Arabia and Islam are essentially spirits (according to the Qur’an, they are made from ‘smokeless fire’). Demons of this type appear regularly in the Old and New Testaments: Job is tortured by them, while Jesus later casts them out. Over time, both Judaism and Christianity began to organize these demons into hierarchies, to match the ranks of angels described in the Scriptures. At the top of the pile sat Satan, the fallen angel who had dared to challenge God. Beneath him were hordes of demons arranged into ‘legions’ (in Mark 5:8, a demon explains that he is called ‘Legion, for we are many’). In 1467 the Spanish bishop Alfonso de Spina calculated that the total number of demons was 133,316,666, but a century later the Dutch demonologist Johann Weyer put the figure at a more conservative 4,439,556, divided into 666 legions, each composed of 6,666 demons. Either way, there were a lot of them. Since the Bible does not include any physical description of demons, artists were free to invent their own forms. This they did with relish. Often demons appear as smaller versions of Satan; invariably they are as ugly as possible, a mish-mash of different animals given an approximately human shape. Their grotesque appearance tells us that these creatures are up to no good. By the Middle Ages, demons were depicted everywhere: in manuscripts, in paintings, in the sculpture and stained glass of churches. Grisly scenes of the Last Judgment show sinners bundled off by horrific creatures, while the elect are gathered up by serene angels. Looking at the sheer inventiveness that has gone into depicting these monsters, one cannot help but suspect that the medieval masons rather enjoyed carving them. As it happened, the saints’ lives offered yet more opportunities for depicting devils and demons: one especially popular legend featured St Anthony, who was mercilessly tormented by unpleasant creatures determined to test his faith. Europe teemed with the demons, both seen and unseen, and Asia was similarly infested. Hinduism and Buddhism recognize several categories of demon, ranging from the evil, shape-shifting rakshasa to the more ambivalent asura. Indian miniatures often show hordes of rather dim-looking demons being knocked about like skittles by stout heroes. In Japan, the concept of demons can be expanded to cover any number of supernatural creatures. As elsewhere, these oni (as they are known) can be either helpful or evil. Although originally conceived as invisible spirits, they gradually took on the appearance of humanoid ogres and are often depicted with horns (not unlike many European demons and devils) and carrying an iron club. At the centre of the rings of demons sits Satan - the Devil, Lucifer, Beelzebub, the Prince of Darkness, the Antichrist. In fact, these different names refer to subtly different characters, who over time have become rolled together to create an all-in-one package of ultimate evil. What seems certain is that this chief opponent of good originally worked for God. However, pride led him to mount a rebellion against his creator, who as punishment consigned him to Hell, along with the angels who had backed him. Of these various names, the most authentic is Satan, which, alongside ‘devil’, is used extensively in the Bible. Its origin is obscure, but it may mean ‘prosecutor’ or ‘adversary’. In the New Testament Satan appears to Christ in the wilderness to offer him the riches of the world and to test his goodness (‘Get thee behind me, Satan’ was Christ’s response). From this, the Church developed the idea of Satan as the tempter, trying to ensnare us in our daily lives. The name Lucifer, often associated with the morning star, means ‘lightbringer’; some believed that it was Satan’s original name when he was an angel. The name Beelzebub, meanwhile, means ‘Lord of the Flies’; some commentators equate Beelzebub with Satan, or else see him as one of Satan’s chief assistants. The term ‘Antichrist’ comes from the biblical Book of Revelation, where he appears as a key figure at the end of times. Artists had to make Satan’s physical appearance match his capacity for evil. Our modern conception of the Devil - tail, bat wings and assorted bits of goat - came about in stages. The wings he presumably kept from his time as an angel, while the elements of goat - sometimes a head, sometimes legs - could derive either from the ancient god Pan or simply from a long line of hybrid monstrosities. The tail, on the other hand, may be a reference to the Beast described in the Book of Revelation. Artists have constantly surpassed themselves in their depictions of the Devil’s cohorts and minions. In Christian iconography, they appear in scenes showing the Descent into Limbo (which often includes the Mouth of Hell) and at the Last Judgment, as well as in episodes from the lives of certain saints. The Church of St Mary in Fairford, England, is famous for its stained glass demons, and early Renaissance art in the Netherlands and Spain contained some astonishingly inventive examples. The master of the monstrous, however, was Hieronymus Bosch. Even today, in the wake of Surrealism and all that modern art has thrown at us, his images are shocking. Their intricate detail draws us closer, into a web of vice and punishment. We see bizarre animals, giant birds, limbs mutating into branches or other objects, bodies hollowed out and inhabited. These demons are no longer straightforward demons, but monstrous hybrids, symbols of a life wasted on sin. ". . . without doubt one of the best (if not the best) bestiary-style publications that has ever hit the book-shelves. 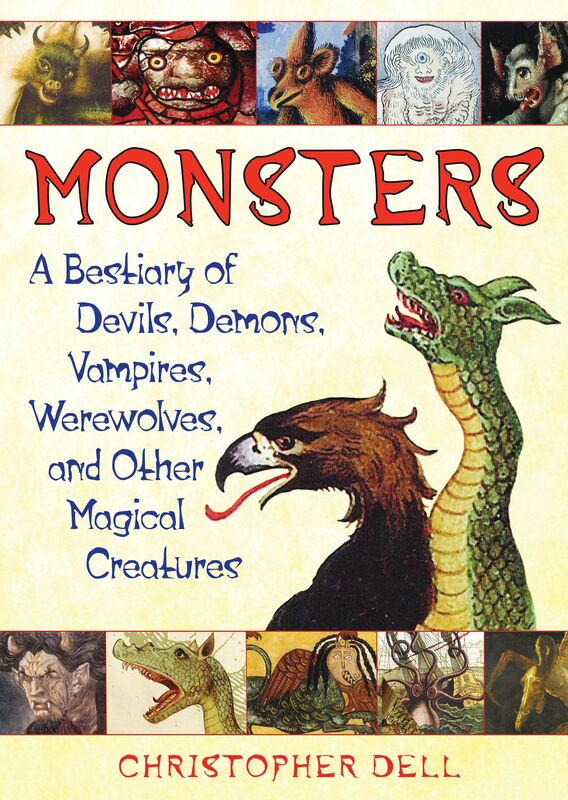 . ."
"This is the big book of monsters for little kids and big kids and everyone in between. It's a treasure-trove of fantastic art showing fantastic creatures from all around the world and from all cultures-from ancient Egypt, Mesopotamia, and China all the way up to Frankenstein, Big Foot, and Pablo Picasso." " . . . a unique collection of art that should be on every historian of horror's shelf. Whether you like to read or just enjoy a great picture book, Monsters provides a healthy dose of each to satisfy your curiosity. . . Hard to put down and hard to get out of your head.....history holds some captivating monsters, and so does Christopher Dell's collection." "The selection of illustrations almost can't be topped . . . Readers will find themselves poring through this book to read about these similarities and to take in the wonderful illustrations . . . This intense anthology would make an excellent addition to any research library. It also would be an interesting novelty coffee-table book."